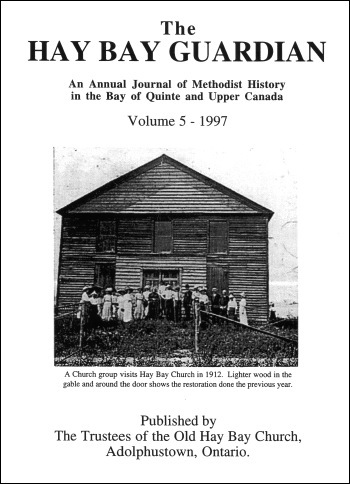 Published by the Trustees of the Old Hay Bay Church, Adolphustown, Ontario. Numbers: It was a wet summer and the numbers were a few hundred less than in `95. The Guest Book recorded 200 visitors June 8, 9, and 15-30; July, 417; August, 601; and September 1-23, 197: for a total of 1415. The Custodians counted 1686, though undoubtedly many were missed. Most were from Ontario, 63 from other provinces. Other signers came from 21 States, 11 European countries, plus, Jamaica, Japan, China and Korea. Group visits brought two vanloads from The Towers Nursing Home in Port Hope, 3 carloads from Edith Rankin United Church's U.C.W. Unit 4, and a group of 32 from an Elderhostel program. Three weddings were celebrated in the church, plus a Masonic service and the annual Pilgrimage Service. A poignant scenario from the War of 1812 wherein Lydia Hayward struggles to find her husband-turned-deserter. Rev. William Case (1780-1855) became involved in the War of 1812 by chance. Having served in Upper Canada and New York state since 1805, he was at this time the Presiding Elder of the Oneida District of the Genesee Conference. With the help of Joseph Kincaid, the preacher on the Black River circuit, and one other, he was preparing for a camp meeting. The booming of cannons drew him to the battleground-where Lydia Hayward's husband Joshua, was one of the soldiers defending the harbour. Please remember that this is a replica of a page in Volume 5 of the Hay Bay Guardian and these are not current product offerings! In the 1994 issue of the Hay Bay Guardian, we did a biography of William Casey (1760-1842), one of the subscribers of 1792. We also featured his great-grandson, Orrin Robinson Casey, a native of Newburgh, Ontario, who claimed to be the original model for Ernest L. Thayer's immortal poem, "Casey at the Bat," first published in the San Francisco Examiner on 3 June 1888. A bit of a nagging doubt made us send off an enquiry to the National Baseball Hall of Fame in Cooperstown, New York. We are grateful for a recent reply from Public Services Librarian, Timothy J. Wiles, who sent us a great deal of enlightening material, to which we now refer. If you'd like to explore more about Methodism, drop in on, their annual meeting. In 1997, it will be held at Emmanuel College, Victoria University, in Toronto. You don't have to be a member, you can drop in and sample a session or two. It begins on Sunday evening, June 22nd, with a worship service in the chapel, followed by an opening address. On Monday, well-prepared papers will be delivered on "Methodist Books of Discipline," "Wesleyan Sanctification and Women," "An Examination of Wesley's Understanding of Christian Perfection," and "The Ecclesiology of Enthusiasm: The Methodist Case." Research never seems to finish. In the 1994 issue of the Hay Bay Guardian, the story of Samuel Coate was given [see "Samuel Coate; A Fallen Meteor," pages 11-18]. He served over ten years in Canada, married a niece of Barbara Heck, and was the chief instrument in building the first Methodist chapel in Montreal, touring England and the States to raise funds for it. At that time we had no dates of his birth or death. This photograph by Al Capon appeared in the Kingston Whig-Standard following the Annual Pilgrimage and Service of Sunday, August 29th, 1971.